The GoPro HD is not exactly new news. In fact, as of the date of this article, it’s the most popular point of view camera in the field. This ubiquitous square box is seen on helmets, on chests, on bikes, cars, plane, trains and automobiles. However, GoPro hasn’t sat on its laurels and is constantly innovating. Bringing the price point of HD point-of-view video cameras down into the $300 range wasn’t quite enough — now GoPro has released the GoPro HD Hero 960 camera at a price below $ 200. Some other small nitpicks that most people have with the GoPro HD are still present. Sound quality is still not great. Menus are still cryptic (you can solve this by reading the manual but lots of people don’t do this). The sound the GoPro makes when turning on/off and recording are still quite soft. The field of view is a wide fisheye. Everything looks far-away. You can be a couple of bike lengths away from your buddy and still look like you’re in the next province. Fish-eye flattens everything and makes it look small so steep trails look like gravel paths and that 50 footer looks like a curb-stomp so your Internet bragging rights will be diminished. Having said all this, do not lose sight of what you still get with the GoPro960; a terrific little camera which can shoot 960p HD video (1280×960 pixels (4:3), 30 fps, 12 Mbit/s data rate) and 720p HD video (1280×720 pixels (16:9), 30 fps, 8 Mbit/s data rate). It’s still one of the toughest cameras around and has the best mounts of any POV camera. There are endless geek arguments over the merits of 60 frames-per-second (fps) video vs 30 fps video and whether the human eye can tell the difference. What matters though is how YOU will see the video, whether you can even see a quality difference, and if you can, whether that quality is worth a $ 100 to you. At the outset I will say that, in my opinion, the 720p @ 30 fps rate is what most people will shoot and they’ll be happy with it. More below. I think many people will care about video quality after the videos have been uploaded to the web. General consensus is that some websites preserve video quality the best. Vimeo, for example is considered to be one of the better sites at preserving quality. Youtube and Pinkbike are considered to be more middle-of-the-road for quality. At the time of writing, neither of these three websites preserve 60fps quality. Even if videos you create are rendered at 60 fps quality, the footage you see on screen are played back at 30 fps . On to the videos. Both videos below are on a flat slickrock trail in very good light (St George, Utah, if you’re interested). You have to be a Vimeo member to download the footage. I couldn’t think of any other way to deliver the footage so you can look at the video on your own computer, compare it side-by-side and decide for yourself whether was a difference. Apologies in advance for it being boring footage – all I wanted to do was give you the chance to look at 10 seconds of footage and decide for yourself as to whether there was a quality difference. Remember there are no wrong answers – its in the eye of the beholder. In my opinion, most people who’ll be using the GoPro will care more about the quality of the video once its uploaded on the web to share with people. However, if you want to shoot slow-motion video, then there is no substitute. 30fps video does not look that good in slow mo. 60 fps video offers a substantial upgrade in quality and you will need to spend the extra $ 100 and get the full-featured GoPro HD Hero. Heck – spend a extra ten thousand or more and get a RED. 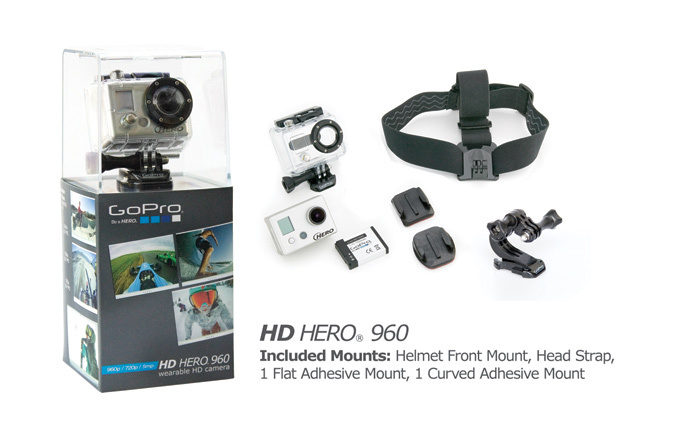 Buy the GoPro HD Hero 960 in the US ($179.99) or in Canada ($199.99). I reviewed this camera myself and the swaying factor for me was the 60fps slow motion mode, as you say anyone using these cameras will care about quality of video and that slow motion footage just looks beautiful at 60 fps. I couldn’t do without that. I’ve reviewed a few of these cameras over at GoPro 960 and having used them for a while you come to realise the beauty is in that FULL HD. Very important!